Shippeo works with carriers of all sizes to securely collect and share real-time delivery information with their customers. This helps you, as a carrier, deliver a differentiated quality of service and benefit from significant time savings. Transmitting real-time information to your customers has never been easier. Shippeo securely collects real-time data from your systems and surfaces it on your customers' platform of choice. Use Shippeo's free and simple mobile app for your drivers, available on iOS and Android. PLENTY of benefits for carriers, too ! 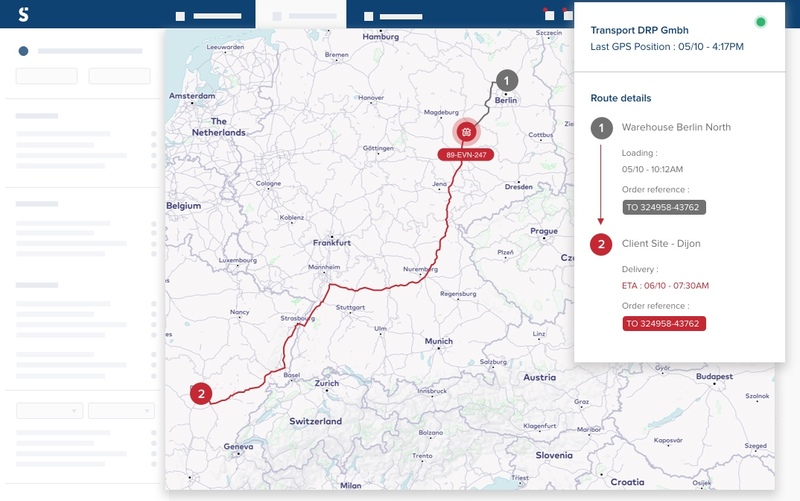 Provide your shippers with the best quality of service by giving them instant access to real-time and predictive information for all their deliveries. Eliminate the need for time-consuming calls or emails, or the manual input of delivery information into multiple shipper portals. Delivery times are precisely recorded by GPS and geofencing, helping you objectively demonstrate you were on-time. Say goodbye to complicated software. Your team will enjoy using our simple, yet powerful, platform on a daily basis. The confidentiality of your data is our utmost priority. A neutral software provider: Shippeo is neutral in the relationship between shippers, logistics providers and carriers. Shippeo agrees not to use collected data to develop a competing activity, or to become a substitute for logistics providers or carriers. Respect of data ownership: each carrier owns the data they share with Shippeo and therefore retains the right to access, modify and delete such data. Your data is used for no other purpose than the provision of the service and is not resold to third parties. Service at the forefront of regulation: Shippeo is compliant with the current regulations (RGPD) on the processing of personal data. Join Shippeo's rapidly growing carrier network now.